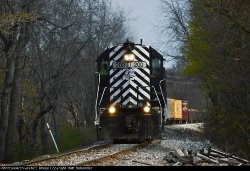 Welcome to Matt Delsander's Railroad Picture Archives! Welcome to the RRPictureArchives.NET contributor site of Matt Delsander. Enjoy railroad photos from all over Ohio. Every photo here is copyrighted by Matt Delsander. Wheeling 663, and the "Flash"
The Unexpected Z642 Stone train.